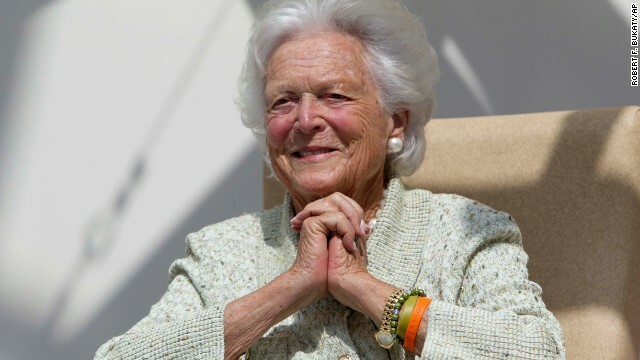 Former First Lady Barbara Bush is not trying to pull the rug out from a possible presidential bid for her son, former Florida Governor, Jeb Bush, a Bush family spokesman tells CNN. The spokesman tells CNN’s State of the Union that Mrs. Bush feels misinterpreted by the media coverage of her most recent comments. “Her point is the family feels no entitlement as it relates to the presidency,” said spokesman Jim McGrath. "I think this is a great American country, great country, and if we can't find more than two or three families to run for high office, that's silly, because there are great governors and great eligible people to run," Mrs. Bush said in the C-SPAN interview. Though her son is certainly qualified to run for president, the former first lady said, "I hope he won't." "Because I think he'll get all my enemies (and) all his brother's,” she continued. “And there are other families. I refuse to accept that this great country isn't raising other wonderful people." But, this isn't the first time the former first lady delved into Jeb Bush’s political future. "We've had enough Bushes," she told NBC's "Today" in April, 2013. The former two-term Florida governor is considering running for president in 2016, though he says he still hasn't made a final decision.